Xian (pronounced she-anne) is home to the world famous terra cotta warriors and a major city in Northern China. Citizens of most nationalities will need a visa to visit China. Flights from Beijing are frequent and travel time is approximately two hours. If you have some time and want to save some money, direct overnight train service takes approx 11-12 hours for this journey on routes Z19 (Beijing West to Xian) and Z20 (Xian to Beijing West). You can also take high speed trains which make the trip in five hours. Foreigners require passports to purchase train tickets. Xian's airport is Xianyang (XIY). International departures and arrivals use Terminal 2. Do not arrive too early when departing since the international area does not open until approx two hours before a flight. Best way to get into Xian from the airport is by airport shuttle bus. Fare is 26 Yuan (25 plus 1 Yuan fuel surcharge). Check the current routes at the bus operators website http://cwagi.com/ (use google translator). Taxis at the airport turn off their meters in order to extort the maximum amount of money from tourists. You will need to bargain keeping in mind a metered fare to the bell tower should cost between 120-150 yuan. Taxis are inexpensive in Xian but it is difficult to find an empty one during busy periods. Do not expect your taxi driver to speak English so have your destination written in Chinese. The metro is brand new (opened Sep 2011) with one line complete and more lines under construction. The current line 2 only runs north-south intersecting the bell tower. Ticket machines have English instructions and accept bills except for the 1 Yuan note. You can get change for large bills and 1 yuan notes at the staffed counters. Buses are a good way to get around although destinations are only displayed in Chinese. Buses stop at all stops so you don't need to press a buzzer if you want to get off. Fare is only 1 Yuan for non air-conditioned buses and 2 yuan for air conditioned ones (K prefix on routes). A popular route, 611, runs from the railway station to the bell tower. Check the back of bus stop signs for timetables and operating hours. Museum of Qin Terracotta Warriors and Horses - The cheapest way to get to the museum is to take bus 306(5) from the parking lot southeast of the railway station outside of the wall. Fare is 7 yuan collected on board. First bus is 7am and travel time is about an hour. Avoid buses 914 and 915 since these take much longer and have more stops. The ticket office opens at 8:30am and entry fee is 150 yuan. It is advisable to get there first thing in the morning to avoid crowds later in the day. It is a bit of a walk from the ticket office to the main site but a shuttle service is available. The shuttle isn't offered when exiting since you are forced to walk through a shopping complex. Don't miss the bronze chariots in the exhibit hall and the 360 degree movie theatre. Your ticket includes entrance to the emperor's tomb 2km away. Free buses depart from a stop by the main parking lot. Bell and Drum Tower - These towers are the symbols of Xian and lit up nicely in the evening. The drum tower marks the south entrance to Muslim Street. 50 Yuan for entry to both or 35 Yuan individually. Great Mosque - Open to visitors with 25 Yuan entry. Enter from the souvenir market directly west of Muslim street and you'll eventually reach the mosque. City Wall - Over 13km in length, the south gate is probably the easiest entrance to find. Entry 40 Yuan. Best way to see the wall is to rent a bike for 40 yuan for 100 minutes with 200 yuan deposit. Not a smooth ride since you constantly need to dodge missing bricks and rough patches. Bring water before entering to save some money. The south side has multiple bike rental locations so be aware of this fact if you want to do a complete loop. 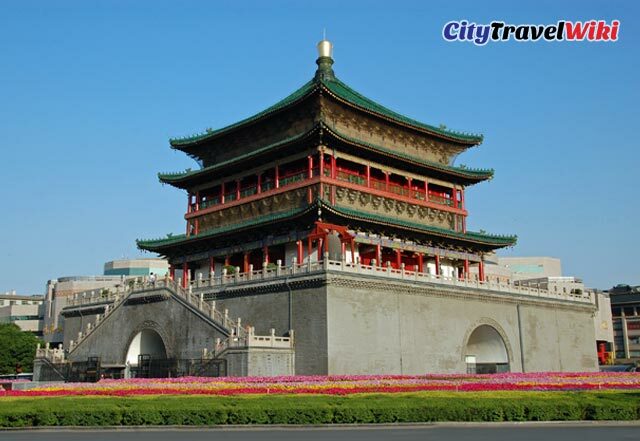 Shaanxi Museum - A popular museum located between XiaoZhai metro and the Big Wild Goose Pagoda. Has terracotta warriors not behind glass. Free entry with passport (limited number available per day). Get there early to avoid lone lineups. Opens at 8:30 - 6pm in summer months. Closed Mondays. Metro XiaoZhai and walk or hop on a bus heading east on XiaoZai Rd. Big Wild Goose Pagoda - located on a large complex with monorail, shops, restaurants, and a musical fountain. The fountain show runs weekdays noon (no noon show on Tuesday), and 9pm with additional shows every 2 hrs on weekends. The pagoda is located on the grounds of Da Ci'En temple with 50 Yuan entry fee (entrance on south side). It is an additional 30 Yuan to climb the pagoda. Metro XiaoZhai and then bus or walk heading east on XiaoZai Rd. In the future, you will be able to transfer to the new metro line and take it one stop east to Dayanta North. At the south end is a shopping complex, Qin Han Tang Emporium, with a giant LED screen in the ceiling. There is a food court in the basement. Small Wild Goose Pagoda - located on the grounds of the Xian Museum. Entry to the museum and grounds is free with your passport. There is a 30 yuan charge to climb the pagoda. Metro Nanshaomen. Head west along Youyi West road and turn left at the first major road to find the entrance of Xian Museum. Hanyanling Masoleum - A less popular tomb populated with figurines and miniature animals. It is on the way to the airport. 80 Yuan entry and an extra 10 yuan for the movie. Take Bus 4 which runs hourly starting at 8:30am (verify timetable at the back of the bus stop sign) from Shitushuguan metro station Exit D. Fare is 2 yuan and travel time is 30 minutes. Hike the main route up to North Peak. Approx 4 hour hike from the main entrance. Take North Peak cable car. 80 Yuan one way or 150 yuan return. Requires buying a bus ticket (20 yuan) and cable car ticket. Hike Soldier's Path under North Peak cable car. Approx 2 hr hike. Buy the bus ticket at ticket office. Take the new West Peak Cable Car. An expensive 140 yuan one way - Bus ride is approx 40 minutes to the west cable car station and costs 40 yuan. Cable car terminates inside the mountain through a tunnel in a valley between West and South peaks. From North Peak, you will need to climb up a pass through the Gold Lock Gate to get to the other peaks. The recommended route to see all four peaks is clockwise from East Peak to South Peak to West Peak. Central peak can be missed since it isn't that high nor scenic. For the adventurous, there are two thrilling side trips which require renting a harness for 30 yuan. The Sparrow Hawk Steps at East Peak leads down to the Chess Pavillion and the Cliffside Plank Walk between East and South Peak (head up into the pavillion when you see the banners). Trails are all stepped in either stone or concrete with some appearing recently widened. There are a few vertical sections cut into rock with steel chains (but with alternate easier routes). Photographers (30 yuan for a picture), restaurants, hotels and snack stops can be found throughout the mountain. 10 Yuan shops can be found under the bell tower where you can buy sets of small terracotta warriors and bronze chariot replicas. Beiyuanmen St (Muslim St) - This main street directly north of the drum tower is filled with restaurants and street food. Streets off the main one will tend to have better prices. Directly to west (left) and running parallel is a covered souvenir market which lead to the mosque. On the southeast corner of the Bell Tower is KaiYuan Shopping Mall with a food court on the 7th floor. Luomashi Pedestrian Street - This area is located southeast of the clock tower and runs north-south. There is a Walmart at the southern end. Defu (Bar) Street - Located southwest of the clock tower and contains a high concentration of restaurants and bars. Shu Yuan Men - This street running parallel to the wall by the south gate specializes in art, calligraphy and antiques. Xian has many specialty dishes unique to the area. Biang Biang Mian - A mixed wide noodle featuring a complex written name composed of 58 strokes. Available at many noodle restaurants including several on Beiyuanmen St in the Muslim Quarter and First Noodle Under the Sun (location in northwest corner of the Big Wild Goose Pagoda complex). Dumplings - Xian's version on XiaLongBao can be found in Jia San Restaurant at 93 Beiyuanmen. Order and pay at the counter pointing to the picture menu displayed above. Take your receipt and find a seat where waiters will fill your order. Pre-paying is standard procedure in many Xian restaurants. De Fa Chang, a famous dumpling restaurant, is located on the northwest corner of the Bell Tower Square above the Haagen Dazs. The ground floor is self-service while upstairs has banquet rooms. The expensive, multi-course dumpling sampling menu has mixed reviews. Rou Jia Mo - Xian's version of a hamburger, is essentially chopped meat served in a bun. Found in many restaurants and street side stalls. Yang Rou Pao Mo - A mutton based soup, you are first given a piece of unleavened bread which you need to break up into tiny pieces (like a giant cracker). The best restaurants are on the Xiyanghshi St heading left at the end of Beiyuanmen. Try cafes for wifi. Facebook is blocked in China.